How God brings two seemingly different people together in marriage. Many people wouldn’t put Taylor and me together. In high school, we probably would not have been friends. She probably would have thought I was a nice, boring, judgmental Christian kid; I probably would have thought she was a nice, lost, party-scene girl who guys like me are supposed to avoid. People like us, with our backgrounds and histories, are not supposed to meet, fall in love, and covenant their lives to each other. Dan Black on What the best leaders do before bed. While a morning routine is valuable, we should not overlook our nightly routine. The morning is about preparing for the day’s activities while the night should be about refocusing our energy on specific activities that allow us to relax and recharge. The best leaders have specific activities they routinely do before going to bed. David Murray on 7 lessons from failure. My failures are usually the result of over-confidence. When I’ve failed it’s often because I was putting too much trust in myself and not enough in God. A happy side-effect is that it has usually produced more prayerful dependence upon God. 12 important things about unchurched families. Unchurched people feel no more guilty about missing church on a Sunday than you feel about missing synagogue on a Saturday. Blessing is not something we talk a lot about in our culture, or experience or do. Our culture is more concerned about being right, putting others down, getting others in line, controlling outcomes. Yet, blessing is something long for. Have a right heart. No one blesses from a place of pride or selfishness. It is a giving away. It might be financial, time, effort, care or love on your part to someone else. This is why it is rarely done. We bless people we think deserve, instead of blessing the people God has given to us. I remember when I got married and the pastor who had mentored me through college prayed over me. It was one of the most emotional moments of my life. Here was a man that to this day, I have done very little for simply because I couldn’t give him anything. He mentored me, showed interest in me, used his connections to better me and my ministry and he was asking God to pour more blessings on me. That’s a right heart. Giving, knowing that you will get nothing back. Be willing to serve someone. Blessing is about giving something of yourself away, to someone. You may serve them, be generous to them. It might simply be words spoken to them. It will require you to take a step towards them. Blessing is not reciprocating. There is a difference. When I bless my children, I am not expecting them to give something back for it, or to earn it. Blessing shows someone where they have come from, but where God wants to take them. Each year, I write a letter to our kids on their birthday. In the letter, I highlight how they have grown this year, how God has worked in their hearts and lives, what has happened in our families. My plan is to give these letters to them when they graduate high school and go to college. I want them to have a picture of who they are, where they have come from, so that it influences them onto where they are going. In Scripture, when someone blesses someone there is usually a genealogy nearby in the text. This is a reminder of where these people have come from, their history. In essence, it is who they are, their identity. 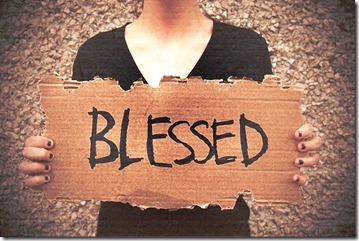 Blessing is a way of reorienting someone’s identity, helping them to see things more clearly so they are on track. What an incredible week we had last Sunday at Revolution! We broke through 400 as a church, had 2 baptisms, 7 people indicated they began a relationship with Jesus and we had over 25 first time guests. I’m excited to see what God has in store for us this Sunday as we continue our brand new series Change as we look at Galatians 1:6 – 10 if you want to read ahead. As you think about change in your life, at some point the idea of being free from something will come up. I said last week: the reason most people fail to change in their life is they change the wrong things. This week, we’ll take that a step further: the reason most people fail to change in their life is because they look to the wrong things to changethem. In our lives, we look to our willpower or circumstances (I’ll change when I get married, have kids or _____ happens) to change us. We look to other people to change us, (if they notice me, accept me, love me) that will bring change in my life. We look to a lifestyle, having a certain car, gadget, house, vacation or comfort to change us. We don’t just look to these to change us, we look to these things to save us as well, to give us hope and a future. In the end, all these things give us what they promise to give us, not what we hope they will give us. If you or someone you know looks to something or someone other than Jesus as their hope for change, life, purpose, security or approval, this is a great week to bring them to Revolution. If you brought someone with you last Sunday, shoot them a text and invite them back this Sunday. Trevin Wax on The uselessness of twitter battles. Twitter is a place for conversation, but once we go into battle mode, I think the legitimate conversation is already over. Twitter battles are like putting on a spectacle for the perverse pleasure (or dismay) of the Twitter audience. Has anyone watching one of these debacles ever said, “You know what? You convinced me! I’m wrong and you’re right.” No one. Ever. 21 ways to perk up your productivity. Chuck Lawless on 10 ideas from wise leaders. Give your family veto power over your schedule. He’s an incredibly busy man, but he somehow manages his schedule well. Here’s what he taught me: involve your wife before you make a commitment that requires you to be away from home after work hours. Be prepared to change your schedule if your family says, “We need you at home.” You’ll be less likely to lose your family in the midst of busyness if they have opportunity to help you plan your schedule. Denny Burk on How to deal with false teachers. Not every purveyor of false teaching is a lackey of the Devil. We have examples in scripture where bona fide believers are the source of error in the church. Apollos was a man mighty in the scriptures who taught accurately about Jesus but who nevertheless was only familiar with John’s baptism. In Apollos’ case, his deficient teaching was an error of omission. He simply did not yet know the full apostolic message. Priscilla and Aquila came alongside Apollos and explained to him the way of God “more accurately” (Acts 18:26). Presumably, Apollos responded favorably to their correction such that Paul would later identify Apollos as a co-laborer in preaching the gospel (1 Cor. 3:5-9). 3 tips on being a friend of sinners. Yesterday at Revolution was awesome. We are in a series called All In right now and I spoke on our part in evangelism yesterday and how we can serve and love those around us to be given a hearing about Jesus. Too many Christians either don’t love well so no one cares or they answer questions people aren’t asking. In the end, we miss the chance to share our faith. Love spending these 4 weeks on this important topic. This Sunday, I’m speaking on how to pray big prayers for your life and for those around you. If you, as a follower of Jesus, are not praying for anyone who doesn’t know Jesus, that’s a problem. If you missed yesterday, you can listen to it here. I have been loving how my MC has been coming together and growing in community. By far, this has been one of our best seasons of MC personally. Saturday night I let my boys stay up to watch the heartbreak that was Arizona’s loss to Wisconsin. While a good game with bad calls made by the refs against both teams, it’s sad when you feel like a game (going either way) is decided by the refs instead of by the players. I read Jonathan Merritt’s new book over the weekend called Jesus Is Better than You Imagined. It comes out tomorrow and you should buy it. Katie and I watched Gravity over the weekend. I thought it was good, thought it would be better than it was, but it is 90 minutes of sheer intensity. We’re working our way through this years Oscar nominations for best picture. Excited to watch 12 Years a Slave and Dallas Buyers Club and of course Anchorman 2. Should’ve been up for best picture. I did the last workout in the crossfit open this past weekend, 14.5. It was 17 minutes of pure pain. I’m blown away how people did it in half the time I did it in. It’s hard to believe that this Sunday Katie and I will celebrate 12 years of marriage. For our anniversary this year, we are doing a date day or sorts next week. Can’t believe she said yes and stayed with me all these years. When you preach or hear a sermon on mission, evangelism you should walk out of their feeling like you were just released and given the keys to life not burdened for a task. Yesterday at Revolution we continue our series All In and I talked about sharing our faith through serving. This series though isn’t really about evangelism or sharing your faith, it is about the motivation to go all in, to change the world, to follow Jesus into the places he calls us. That motivation for changing the world, living our lives on mission, sharing the gospel all come from understanding the love God has for us. The problem in many books and sermons on evangelism, missions or sharing your faith is that at the end, we feel overwhelmed, as if we don’t know where to start. But we also feel like we’ll never do enough. When you preach on evangelism, people should walk out and feel empowered to do everything God has called them to do, because through the Spirit, they can. Now, should your preaching challenge, help others to see how difficult this road ahead is? Yes. But it shouldn’t feel like a burden. Jesus took the burden and gives us his (Matthew 11:28).